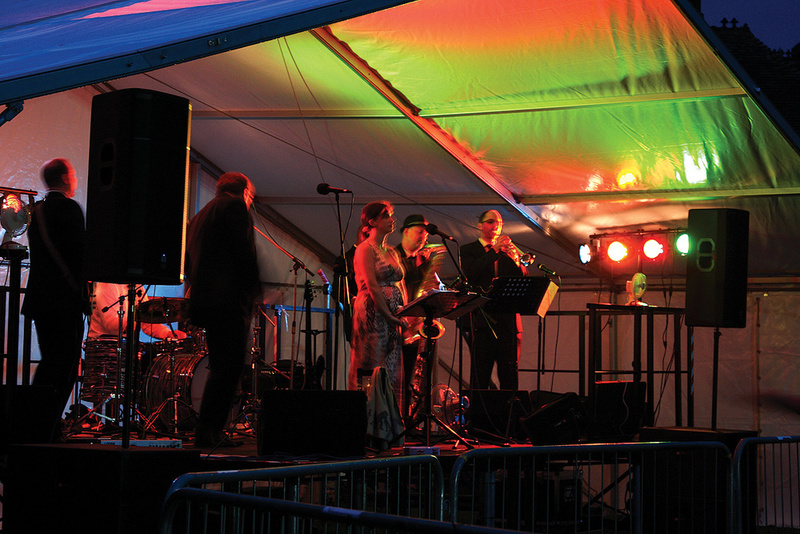 Behringer's new digital mixer and snake system are impressive on paper, but how do they fare under real-life gigging conditions? The newly released X32 digital mixing console from Behringer has generated enormous amounts of interest in the live-sound world, mainly because of its incorporated technology from Midas and Klark Teknik, and its low launch price compared to rival products from other manufacturers. Technical Editor Hugh Robjohns reviewed the console in last month's SOS, but I was asked to take the X32 out on a real-life gig and report back from a user's point of view. What you are about to read is therefore very much my own take on using the X32 live, rather than any kind of technical commentary — for that, you can read Hugh's review at /sos/aug12/articles/behringer-x32.htm. As well as the desk itself, I was given the new Behringer S16, a 16-in/8-out digital snake based on Klark Teknik technology, and Powerplay P16M personal monitor mixer. I didn't have much time to find my way around the X32 before taking it out for real, but I thought I'd better sit with it for an hour or so, get the feel of the controls, and set up the channels I was going to need for an outboor band gig the next day. It was a little bigger than I'd expected, although still nice and compact considering its functionality. It's easy to pick up, as there are good deep handles built in on either side (which also contain the headphone output sockets, one on each side), and it's a manageable 20.6kg, so by no means a heavyweight. 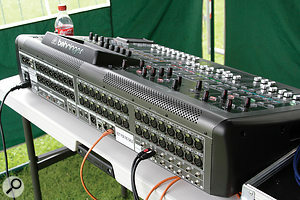 In practical terms, the most noticeable feature of the X32 is that it has a full complement of 32 local XLR inputs and 16 outputs on the rear panel, so it can be used as a live desk without the need for a digital snake, which would be a good option if your venue already has stage feeds and returns plumbed in. In many cases, you could simply put this in place of an existing analogue desk without replacing a single plug or lead. 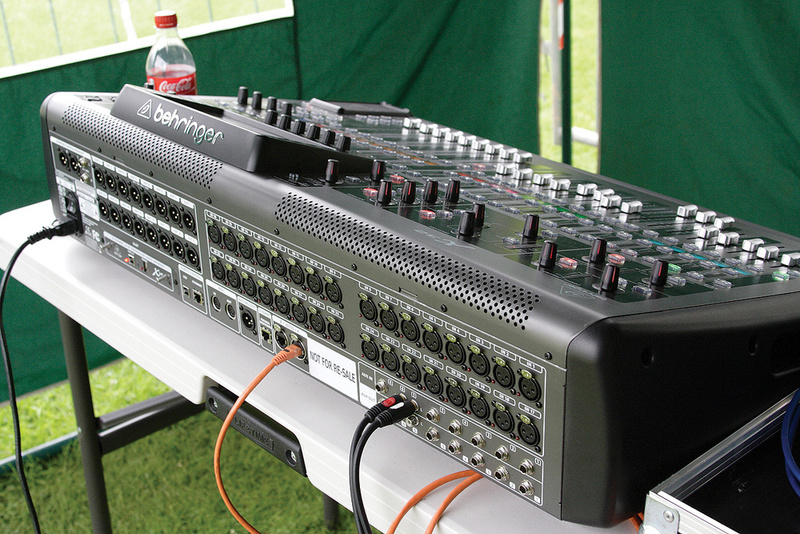 The Behringer X32 and its accompanying digital snake system, the S16, were put to use at an outdoor gig, where the requirement was to mix a total of 13 channels, with four independent monitor mixes going back to the stage wedges. 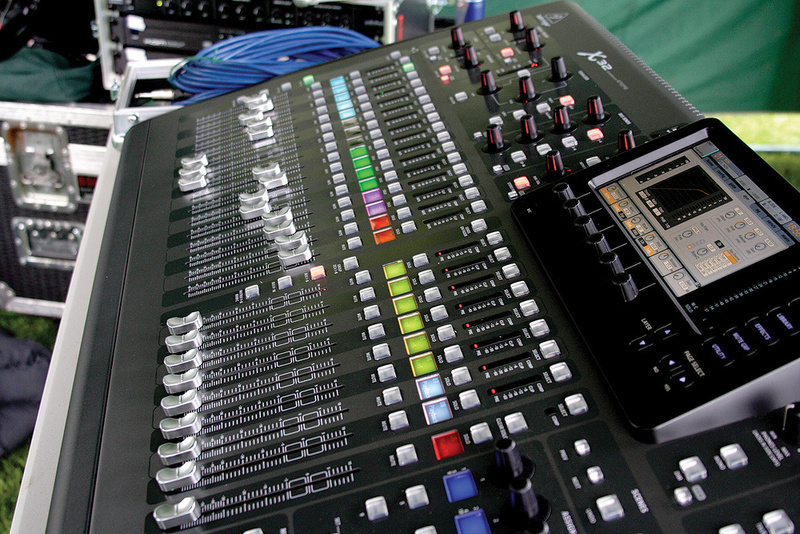 One of the most appealing aspects of a portable digital live-sound mixer such as this is the ability to use a digital stage box and Cat 5 cable instead of a traditional multicore. The X32 is intended to be partnered with the S16, which has 16 analogue ins and eight analogue outs, built into a 2U metal rackmount enclosure. Two S16 units can be connected together by a local data cable, allowing 32 inputs and 16 returns to be carried over only a single Cat 5 connection — which is a blessing compared to having to roll out a heavy analogue snake and painstakingly plug in all the tails and returns. This feature alone should be enough to make anyone turn to digital! The S16 has a pair of standard ADAT optical outputs, which can be used for connecting suitable external devices, and which also allow the S16 to work as a stand-alone digital snake in conjunction with an analogue-to-ADAT converter. 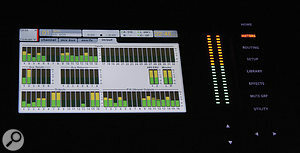 Input parameters such as the head-amp trim and phantom-power switching can be controlled either from the S16 or from the X32 surface, and there's also a dedicated Ultranet connection for use with the Powerplay 16 personal mixing system (see 'Powerplay Monitoring' box). By default, the X32 routes all its local analogue inputs to the first 32 processing channels, but this had to be reconfigured for use with the S16 snake. Before the X32 arrived, I had been warned that there was no user manual in the box, and when I looked there wasn't one available on the Behringer web site either, just a quick-start guide (the full 'preliminary' manual is actually now available online). I didn't think this would be much of a problem, however, so I started setting up the input and output routing so that I had the inputs and sends where I wanted them, before roughly configuring each channel to save time on the night. The default routing assigns the local XLR inputs on the back of the desk to the first 32 processing channels. I needed to change that, as I planned to use the accompanying S16 and Cat 5 cable. There is no library of presets for the basic input channels, other than block routings that connect groups of inputs to groups of channels, so you have to set each input channel up from scratch according to what you need it to do. In this instance, working from some brief notes supplied by the band I was going to be mixing, I needed to mix five drum-kit channels, bass, keys, guitar, sax, trumpet and two vocals (13 in total), with four separate monitor mixes going back to the stage. This was, thankfully, a nice straightforward requirement, so I decided to begin by routing the 16 inputs on the S16 to channels 1-16 on the mixer surface, and then naming them on the LCD ident screens for easy reference. I needed to connect a local CD deck to the unbalanced RCA phono inputs on the mixer's rear panel, and I normally reserve the top two channels (ie. those on the right-hand end) for this. The X32 has 24 physical faders plus the main stereo output fader, but only the left-hand set of 16 can control input channels. 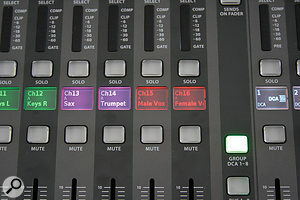 The eight faders to the right can only control groups or buses, so the CD inputs had to be controlled by one of these. The RCA inputs appear on auxes 5 and 6, which are controlled by faders in layer 3, but as I had a couple of spare channels in layer 1, I wanted them to appear there, so as not to have to keep layer-hopping. The inputs are assigned from the routing screen in blocks of eight, and for this job I wanted all of the S16 inputs to correspond to channels 1 to 16 on the mixer surface, so I assigned them by selecting the AES550 A input option in the routing menu. From here it's also possible to select any input channel, bring up its Config screen by pressing the 'view' button, and alter the input assignment from there. Unfortunately, the LCD strip doesn't follow input assignments automatically, which is a shame, as it would be very handy to see any selections reflected here straight away, even if it only displayed the basic default input name. However, I did check that when copying and pasting configuration parameters from one channel to another, the LCD display settings are copied across in full, so after a couple of gigs I'd probably have a few favourite channels stored that I could copy quickly across to wherever I wanted them. As I was starting from the default settings, I had to work out how to assign inputs to processing channels/faders, but without a manual I have to admit that I couldn't discover how to set up the LCD ident strip. After a couple of hours of staring and prodding, I phoned a helpful man at Behringer, who put me right in a few seconds — it's easy when you know how! This process is spelled out in the manual, however. There are many preset names that can be dialled up from a table, and it's then easy to add on extra characters using the next encoder, and then give each channel a background colour to quickly identify different groups or instruments. The per-channel display is really useful and one I'm beginning to miss on my own digital mixer as I come across newer products that have this feature. It's not that there's anything wrong with a good old strip of tape and a Sharpie, but the X32 places the channel name above the fader, ie. right in the middle of where you're looking. Best of all, it's illuminated, clear and easy to read, and just looks cool! The per-channel LCD screens were named and colour-coded for easy identification during the show. So I had the inputs set up in the right places, all the LCD displays set and, once I knew how to do what I needed to (and ignoring my own period of personal cluelessness), it had only taken about 10 minutes of actual 'desk time' to get this far. I now wanted to set up my stage monitor buses, which I would name 'Aux 1, Aux 2' and so on, which is how I usually think of them. I made another call to Germany and was again given instant and patient assistance from the people with the answers. It turned out that what I really wanted was to set the AES550 digital returns to 'out 1-8', and then go to the tab called 'Analog Out', which is what the mix buses are — obvious enough if you think about it. 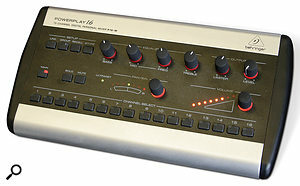 Each of the analogue outputs can then have a mixer source (bus) assigned to it, so it was then a simple matter of stepping down the list and linking 'Mix Bus 01' with 'Output 01' and so on until all six were assigned. It's all perfectly clear and easy to do once you know how, and this is, of course, also covered in the manual. The 'pick from a list of available options' approach to routing is foolproof and does everything for you, in that you can't even try to select anything that won't work, but first-time users will have to take a few moments to understand the input and output options. Anyway, by then I had managed to fully configure the channels and buses I needed, and I felt confident enough to use the X32 for real. Setting up the X32 and S16 at the venue couldn't have been easier, and took about as long as it takes to put something on a table and plug it in. A little green light at the top of the home screen on the desk confirmed that my single AES550 connection was properly made, and it was at this point that I realised that the only long Cat 5 cables I had with me were crossover types. Luckily the X32 seemed quite happy to auto-sense what I connected to it, and all the channels duly appeared in their proper places. While my helpers were busy cabling up the stage end, I started putting low-cut filters on all the input channels as an EQ starting point, by bringing up the EQ screen and using encoder 1, which is dedicated to this function: you just push the knob to turn on the filter, then turn it until the cutoff frequency is where you want it. The process is very intuitive and quick, and I like the fact that the filter is a separate function from, but still in the same screen, as the main channel equaliser. Once we started checking the incoming signals, I decided that I really liked the EQ operation (and the sound! ), as all parameters are available with dedicated per-tab controls, and the screen display is large, bright and very clear even in daylight. The rotary encoders do a good job, and are nice and smooth with a hint of physical resistance in the turning action, which makes fine adjustments easy to perform. The screen and the LCD displays are designed to be viewed more-or-less from above, and although the usable viewing angle is reasonably wide, you can't sit back from the surface and easily read the information — I found that resting my elbows just in front of the X32 was just about right for the LCD strip. One thing I particularly liked was the provision of input and output meters on the screen for each channel and bus, as this makes it easy to check the levels at the preamps and the aux outputs at a glance, which can help avoid overloading within a busy mix. The small LED ladders above each fader serve very well as channel-level monitors, and I found them very useful for keeping an overview of the whole mix. In the 'meters' screen, there are various overviews showing everything that's going on within the mixer. I found a very useful option that showed the metering for all the channels within the layer in use, and by the end of the performance, I had adopted this as my default view. 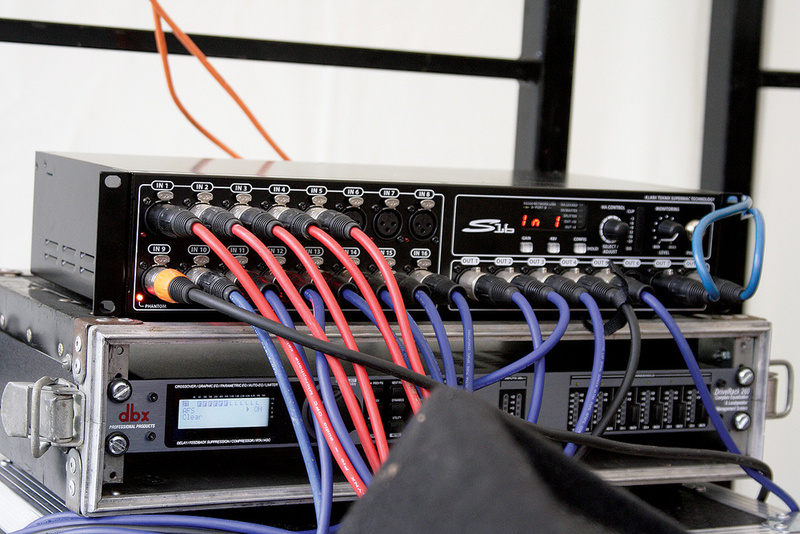 The S16 digital snake is capable of sending 16 channels from the stage to the mixer, and eight channels in the other direction, all via a single Cat 5 cable. When constructing the various monitor mixes for the stage, I found the Sends On Faders mode, where the amount of each channel going to a specific aux send is controlled by that channel's fader, the easiest and fastest method. Although the bus send encoders do exactly the same job, they do so without the 'at a glance' benefit of seeing all the faders as a visual representation of each aux mix. I needed only some basic reverb for vocals and brass, and there were no problems here, either with setting up the reverb type or controlling it. I experimented with two or three different presets and settled for two hall reverbs, which added warmth and body to my sources. The effects were easy to adjust by using the screen tabs and encoders along the bottom, and I liked the large, clear on-screen graphics that made it easy to see what I was doing. I didn't get the opportunity to try out many of the built-in effects, but those that I did hear sounded of very good quality and there's plenty of control available over the parameters. The talkback section is also well thought-out and can be sourced from a local dedicated XLR on the top panel, which appears to be permanently phantom-powered, or from the X32's built-in mic just below the main screen. The single input (you can only have either the external or internal mic, not both) drives two talkback channels, which can be separately controlled. Each can be independently assigned to various output destinations, and set for either latching or push-to-talk operation, and both can be selected at the same time. Once configured and in use, the X32 is an easy beast to ride, and I like the way all the encoders and buttons are quite large and have plenty of space around them. The push buttons that surround the screen have a good, positive click to them, and the legends on these button faces are illuminated, which makes low-light operation that bit easier: in a dark venue this thing is lit up like Christmas and the control panel can be brightened or dimmed to taste from within the utilities section. The other selector buttons within the various dedicated 'strip' functions are of a good size and illuminate brightly when they are active, but the labelling for these is printed alongside them, and needs an overhead lamp to be easily legible in very low light. A couple of these buttons had a tendency to stick now and again, too, and one in particular (the EQ mode selector, which unfortunately isn't one that lights up) tended to stay in its down position, which meant that subsequent presses had no effect until I realised that it was jammed. The meter screen on the mixer's menu can show the levels arriving at any of the X32's analogue or digital inputs and outputs, including those on an attached S16 stage box or P16M monitor mixer.In order to display the parameters of any particular control function on the main screen, there's a small button to press, called View, which forces the screen to show that particular function, and gives access to more detailed layers of adjustment and information. I assumed that a second press of this button would toggle the screen back to its previous focus, but it doesn't do this and you have to re-select another view with the appropriate button. Pressing the Home button will always get the display back to the selected channel, though, so it's not difficult to get out of trouble if you're buried deep inside one of the functions and need to escape. Another observation I made is that when using the main screen to access various parameters, the page tabs along the top can only be located by use of single presses of the left/right arrow keys, and when you get to, say, the right-most tab, you have to press the left arrow repeatedly to get back to the first tab. The X32 performed very well for me, and although I can't say it was the most intuitive user experience I've ever had, if I'd had the user manual and an hour of extra familiarisation, I'm sure it would have been plain sailing. I encountered only one operational problem during the gig: I managed to lose one of the vocal mics from the FOH mix as soon as the band started, which was purely due to unfamiliarity on my part. Each channel's assignment to the main outputs is managed by a dedicated control panel just to the left of the main screen, where the channel output is switched to L/R or mono or both output buses, and where panning or balance between stereo channels is adjusted. If the relevant button isn't lit, that channel isn't routed to the main outs, and the only way I tracked this down was to press 'select' on every channel in turn and watch to see if any lights went on or off, which they duly did and a correction was quickly applied. I'd like to spend a lot more time getting to know the X32, as so far I have only scratched the surface of its capabilities. The things I like most about it so far, though, are the quality and capability of the mixer, and the excellent digital snake system; what I liked least was trying to figure out some of its functions before the manual was published! If I could wish for one change, though, it would probably be to allow all 24 faders to be assigned to inputs, with the bus sends on the second layer. As the review in last month's Sound On Sound says, the X32 has an impressive technical specification and incorporates some significant quality features. When you consider what's being offered for the street price, it's an obvious way to break into the world of digital live-sound mixing without having to remortgage the house or sell the spare Bentley. And with the addition of the equally affordable S16 digital snake system (£519.99 including VAT$799.99), which just makes life so much easier for live sound on the move, there just doesn't seem to be a down side. The Behringer X32 will surely sell in great numbers, and will probably be responsible for many conversions from analogue to digital mixing. Like most digital mixers, the P16M has just one set of channel controls, and a row of buttons selects which channel is being adjusted. 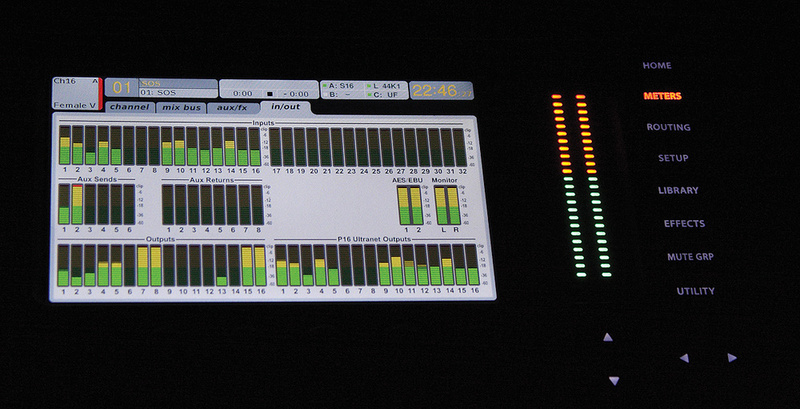 Each of the P16I's six Ultranet outputs can carry all of its 16 inputs, and can also power one P16M personal mixer. The X32/S16 rig is designed to be used with the Powerplay 16, which is a distributed personal-monitor mixing system allowing individual performers to control their own mix from some or all of the live sources available. It's an interesting and attractive idea that would be especially appropriate in places where the performance area is more-or-less permanently established — for example in houses of worship, theatres, or venues with a resident band. I didn't get to use the system on my live gig, unfortunately, as the monitoring requirements were simple and soundcheck time was limited, but I did set it up in my workshop. The Powerplay system can be used on its own or with the X32, and comprises three products: the P16I input module (£199.99 including VAT$299.99), the P16M mixer (£129.99$199.99), and the P16D distribution box (£129.99$199.99), the last of which was not supplied for review. The P16I is a 1U module, with 16 inputs available either on analogue jack sockets or via two ADAT ports (these can be mixed and matched in groups of eight, so you can use eight analogue and eight digital inputs simultaneously). The jack sockets each have individually selectable input sensitivities, with a choice of -10dBV, 0dB, +4dBu and +22dBu. 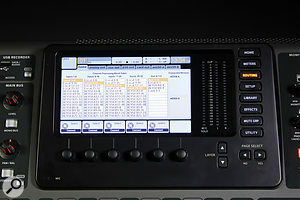 The P16I also has an Ultranet input, which is a proprietary Behringer interface that carries 16 channels via Ethernet. This can be fed either from an X32, straight out of an S16 digital snake unit, or from the P16D. 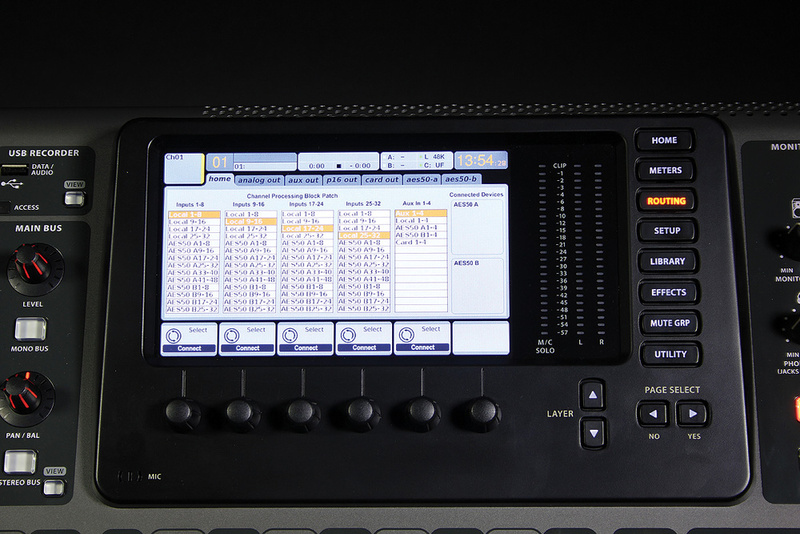 There are six Ultranet outputs on the front of the P16I, and these connect to the dinky little P16M personal mixers, with which a performer can create a personal mix from any of the 16 inputs, to be fed either to a local stage wedge, headphones or an in-ear monitor. These outputs each carry all the 16 source signals, and can therefore feed a number of monitor mixers in cascade on a single cable feed. They also carry power for the mixers, although this appears to be limited to one mixer per output — I tried daisy-chaining mixers off a single Ultranet output and only the first in the chain powered up. The mixers can also be fed, but not powered, directly from an X32, which would be useful in a rehearsal context or when using an X32 as a monitor desk. 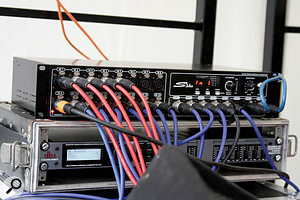 The simplest setup for a 16-channel mix is to feed the P16M from the Ultranet output of an S16 stage I/O box, but again, the S16 doesn't provide power for the mixers, so they would need their external power supplies. The most visible part of this monitor system is the P16M personal monitor mixer, which is a very compact metal-cased unit designed to sit on a special base plate, which can be stand-mounted. The mixer itself measures only about 10 inches across and is very light. 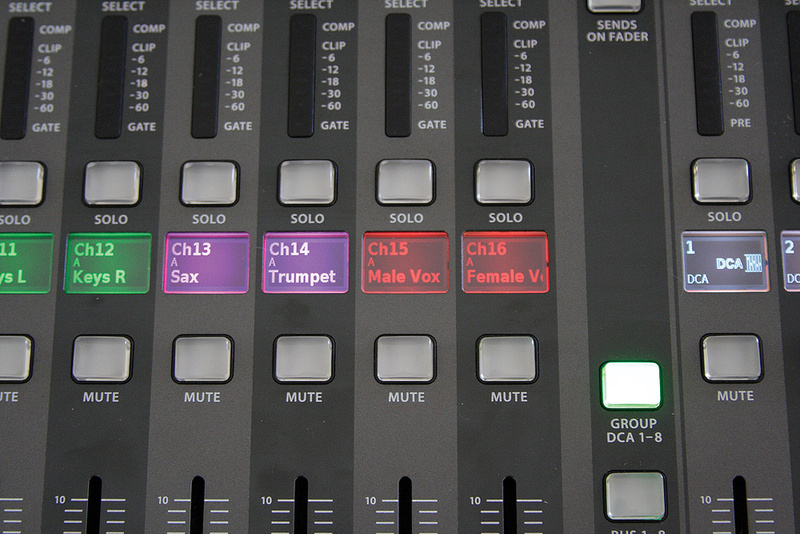 In true digital-mixer fashion there is only one set of channel controls, and the input to be controlled is selected from a row of 16 buttons across the top panel. 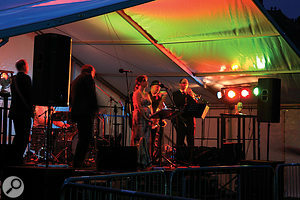 All the basic but essential mixer functions are provided, including a three-band equaliser with a swept mid-band, and there's even an output limiter, which is a sensible inclusion, especially when performers are using in-ear monitors. Inputs can be soloed and muted, so the final mix is entirely in the hands of the performer. Perhaps this spells the end of the perpetual 'more me in the monitor' saga!